However, when it comes to the level of education, Intel Corporation had the highest percentage (92%) of H-1B workers with a master’s degree or more. 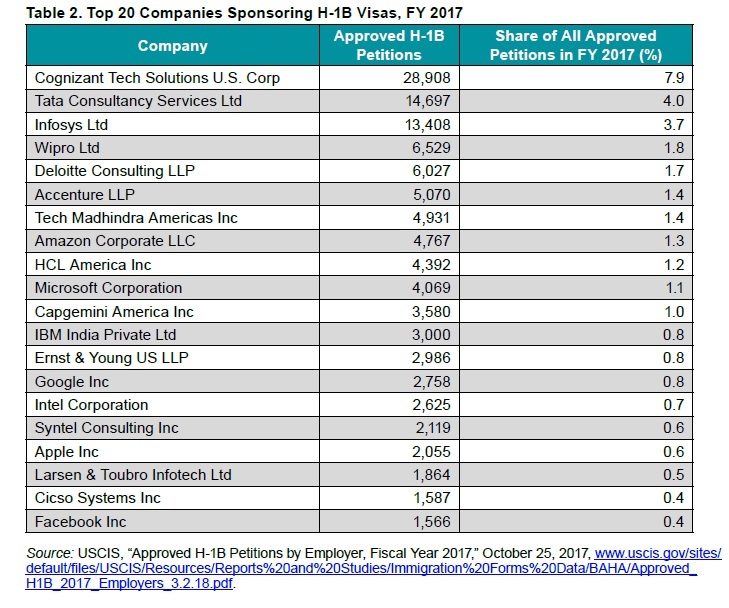 Cognizant Tech Solutions US Corp. took the largest share of the H-1B visas approved in the fiscal year 2017. 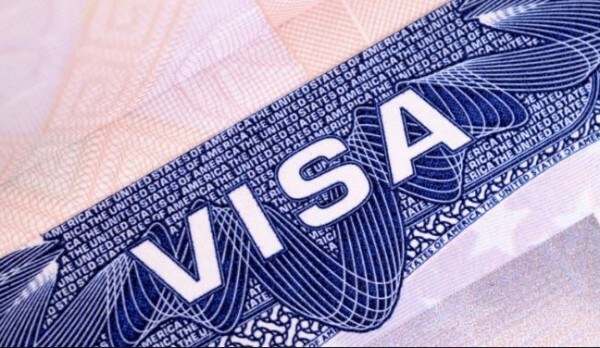 The company had almost double the share of the percentage of approved H-1B petitions in FY 2017 than Tata Consultancy Services Ltd that has the second largest share. According to Migration Policy Institute (MPI), 7.9 percent of the total approved H-1B petitions were of Cognizant. The other companies in the top 10 list for share in the total approved petitions in the descending order of rank were: Tata Consultancy Services Ltd (4%), Infosys Ltd (3.7%), Wipro Ltd (1.8%), Deloitte Consulting LLP (1.7%), Accenture LLP (1.7%), Tech Mahindra Americas Inc (1,4%), Amazon Corporate LLC (1.3%), HCL America Inc (1.2%), Microsoft Corporation (1.1%) and Capgemini America Inc (1%). Credit: Migration Policy Institute (MPI). Although Facebook Inc ranked 20th in terms of its share in the number of approved petitions in FY 2017, the company had the highest average salary at $144,812 in the list of Top 20 Employers of the highly-skilled foreign workers. The second highest average salary was paid by Apple Inc., which was $142,974. 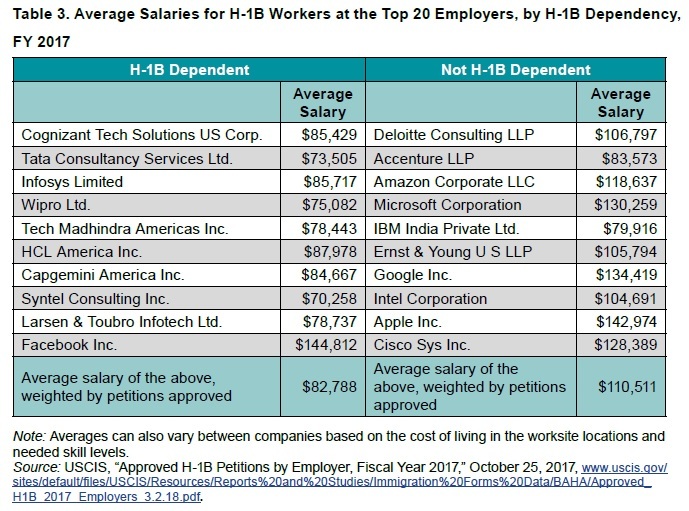 The table below shows the average salaries of the Top 20 Employers bifurcated as per their dependency on H-1B workers. The Pew study has a serious problem. 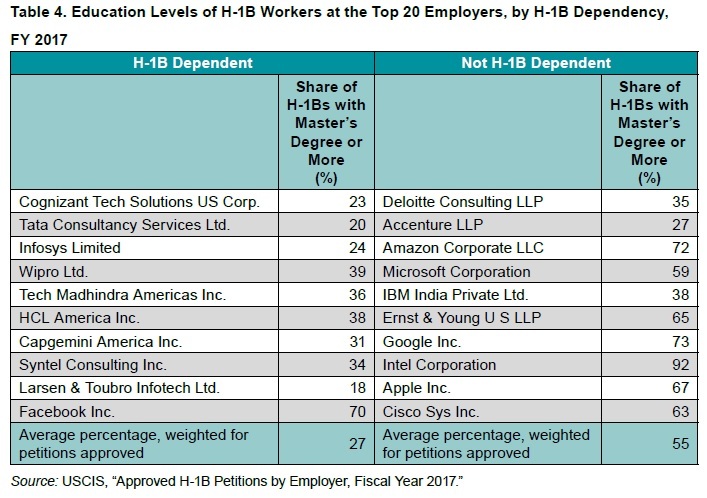 It states: “This analysis assumes H-1B visa approvals are for foreigners who will work at the employer location.” That’s a very bad assumption for consulting and outsourcing firms, the very firms that receive the most approvals. When one looks at the worksite cities, it appears that Silicon Valley gets the most approvals, just as one would expect. See the analysis at http://econdataus.com/pew_h1b.html .